Anyway, I want to draw out a few observations from the dataset. The year was 1900 and the U.K. accounted for 25% of global capital markets, with the U.S. accounting for 15%. Then came WW1, which caused the U.K., French and especially the German capital markets to shrink significantly. The end of the war ushered in the ‘roaring 20s’ which saw the U.S. capital markets growing rapidly to account for half of the global equity markets. It has maintained this dominance since, with the exception of a brief interruption in the late 80s when it was briefly overtaken by Japan. By 1990, Japan accounted for 45% of the global equity market compared to the U.S.’s 30%. Today though, the U.S. now accounts for 53% of global equity markets, followed by Japan at 8% and the U.K. at 5.5%. Will the U.S. continue to dominate? Your guess is as good as mine. But in the absence of a giant crystal ball, adopting a global allocation is a dispassionate and empirically robust way to approach asset allocation. People question whether holding global market cap is a sensible approach, given that the portfolio is invariably dominated by the U.S. They point to Japan's dominance and eventual 'crash' in the late 1980s as an example. As it turns out, if you held a global cap weighted equity portfolio, the decline of Japan in the 1980s barely even registered, as global equity return was mostly positive. This is because, what you lost holding Japan, you more than made up for in your U.S. allocation. Of course, next time will be different. Or so they tell us. Tough times never last... globally diversified investors do? 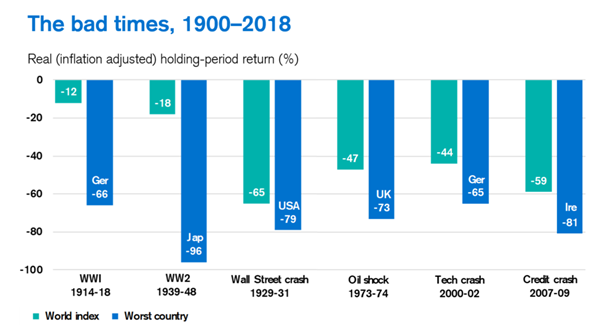 Notwithstanding the impressive performance, equity markets have experienced severe periods, particularly during wars and economic crises. The table below shows the inflation-adjusted decline in stock markets during periods of extreme stress. One quick observation is that global cap weighting equity tends to provide some cushion, at least for investors in the most affected country. But that’s not to say a global investor is completely immune. Irish Equity declined 81% in real terms during the GFC, compared to a mere 59% for a globally diversified investor. Of course, these declines were temporary, and the markets recovered after a few years. And this is exactly why investors demand - and often receive - additional return for the risk they take. The table below shows the range of inflation over the last 119 years in the dataset. For the U.K., the average inflation is 3.8% with a standard deviation of 6.2%. The highest inflation during that period? 23.2%, in 1975! The lowest is a deflation of 26%, which occurred in 1921, at the end of WW1. The U.K. is not alone. Every one of the 23 countries covered in the DMS dataset has experienced double-digit inflation. Some of the worst examples happened in Austria, Germany and Italy just after WW1 and in Japan after WWII. As humans, we tend to have short memories. This translates into what behavioural wonks call recency bias. Most financial planners have inflation assumptions of around 2.5%. To me this is a classic case of anchoring and recency bias. The beauty of applying empirical data to financial and retirement planning, is that we can explore a wide range of scenarios - particularly those that are vastly different from our recent experience.